Howea forsteriana Kentia Palm has a thin, slender trunk with feather-shaped, drooping fronds. When young, the trunk is dark green and turns to brown as it gets older. Kentia's are very adaptable to a variety of soil conditions, which is one of the reasons why they are easy to maintain. 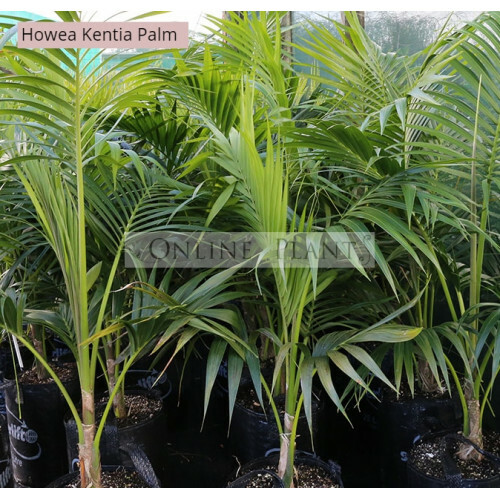 They prefer sandy soils with good drainage so they are good palms to grow if you live in a coastal area. Kentia's can grow up to 18 metres in their natural habitat in Lord Howe Island and will slowly head towards this in your garden. This palm is also a favourite for indoor décor. It is pretty tolerant of neglect and can handle low sunlight exposure, air conditioning and central heating.